Bus rapid transit will come to Chelsea in April with the arrival of the Silver Line. Five years after it was first announced, the extension of the Silver Line to Chelsea will be complete next year, giving riders in the growing city a direct connection to downtown Boston. The project, originally announced in 2013 by then-Governor Deval Patrick, will include an exclusive right-of-way for the buses shortly after they cross into Chelsea from East Boston. Massachusetts Bay Transportation Authority officials expect to begin the extended service in April. The extension will give a new transit option to commuters in Chelsea, a community of 39,000 just outside Boston that is beginning to see a big development kick but has limited direct access to downtown. Although Chelsea has a commuter rail station, it is largely served by regular MBTA city buses that are jammed during peak travel hours. Officials estimate that 8,700 people — 2,500 of whom do not currently ride public transit — will use the new route each day. They hope the 5-mile route from South Station to a final stop west of Everett Avenue will help relieve traffic congestion in Chelsea and Boston’s Seaport District. “Chelsea and the Seaport are very different looking and feeling neighborhoods, but they both share the same challenges of meeting demand consistently with bus service,” Scott Hamwey, manager of long-range planning at the Department of Transportation, told the MBTA’s governing board Monday. 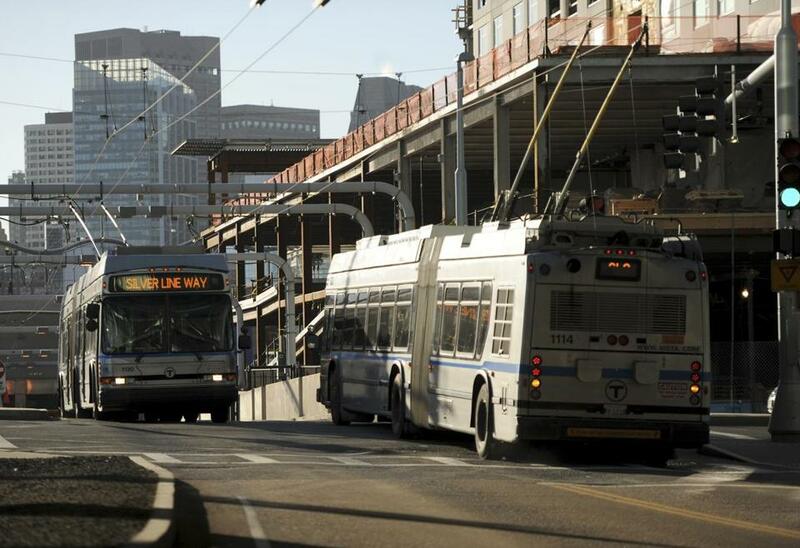 The Silver Line is the T’s “bus rapid transit” system, which includes bus-only lanes on some roads and a roadway solely for buses in the Seaport. From the airport, Silver Line buses will share roads with other vehicles from Logan until crossing the Chelsea Creek, where the bus-only path with four new stations will begin. The route will also create the first connection between the Silver Line and the Blue Line, stopping at the MBTA’s Airport subway station. Jim Aloisi, a former state transportation secretary who grew up in East Boston, said that connection could prove crucial to connecting the Seaport to the massive redevelopment of the Suffolk Downs race course, which sits alongside two Blue Line stations. The route was originally scheduled to open at the end of 2016, but has been delayed by some construction issues, such as bridge and utility pole work, Hamwey said; but the project remains on budget, at $82 million, he added. As part of the project, the state is also relocating the spartan Chelsea commuter rail station to the west. The new commuter rail station will have longer platforms and more shelter, and be fully accessible to riders with disabilities. That station will not be completed until 2019, so commuter rail trains will use the current station until then. Also on Monday, the T’s board heard a proposal to establish a fund from private businesses to pay for agency recruiting, retention, and training initiatives. Transportation Secretary Stephanie Pollack said such a system, which Boston business leaders floated last year, could be in place within a year, but would require safeguards against conflicts of interest that may benefit private interests that donate to the fund.